10.07.2004 - Wild critters get into all sorts of places my customers would rather not have them - in attics, garages, swimming pools, under porches, and so on. 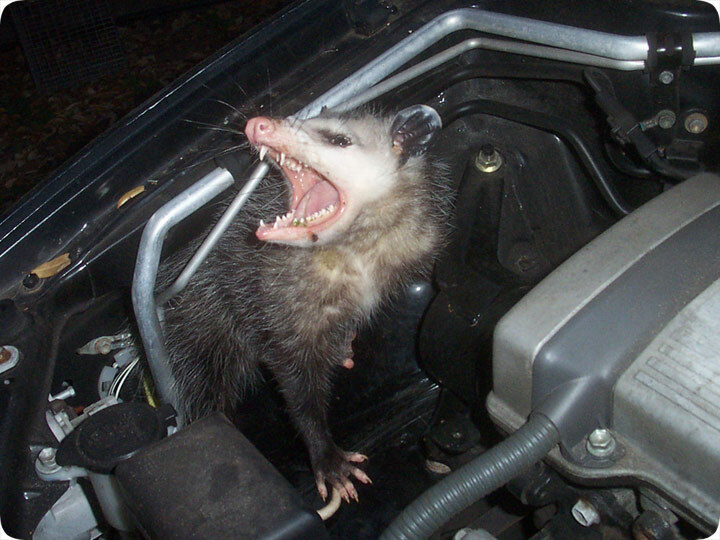 Well, from time to time wild animals get into real zany places, such as this opossum in a car engine! The homeowner left his car parked for two weeks or so without moving it, and then when he tried to start it up, it wouldn't start. He said he noticed a faint odor, but tried to start it again, to no avail - no power at all. He popped the hood and was in for a heck of a surprise when this toothy fellow lunged at him! The opossum had set up shop in the car engine, building a nest with debris and tearing up several of the wires (thus the failure to start). It had no problem climbing up through the bottom of the car and making a nest inside. In fact, given the nature of the opossum to climb under objects and then up inside, such as under a home and then under the bathtub, I'm surprised that this doesn't happen more frequently. I don't like to think about what would have happened had the car started and the animal was in the wrong place, such as near one of the fans or belts. That would have been bad. I came to the home, and of course the stubborn opossum was still there, clinging to its new home, unwilling to leave. I got my snare pole and looped the animal around the torso, and threw it in a cage and removed it. The homeowner had to seek repairs for the damage. I've seen rats, mice, and squirrels live in automobile engines. These rodents often chew on the wires. But this was the first opossum. I have a feeling that it won't be the last. Do it yourself: Visit my How To Get Rid of Opossums page for tips and advice. Opossum deterrent - There have been many studies and forms of research into relocating wild animals just like the opossum and many of them have shown that trapping and releasing the critter elsewhere is not always a good idea, simply because many of them end up dying or just returning back to your abode. Bearing this in mind, you can understand why so many people are choosing to use opossum deterrents in a bid to remove the problem from their lives and unfortunately, many of the commercially bought products and gadgets do not work but this doesn’t mean that there aren’t things that you can still try. Using your own common sense works well when you are trying to deter opossums from using your home as their own, and all you need to do is to look around your home. Are there trees surrounding your home that have branches leading right to your house? These could be used as walkways by the opossum so by cutting them down and keeping them trimmed, you are potentially deterring the creature from entering your home. You could also consider using a strong disinfectant or bleach to mask and remove the smell that the opossum leaves behind. The animals are territorial ones and will have marked out its patch, so by removing this smell, you could be effectively encouraging the creature to look elsewhere to set up home. Another thing that tends to work rather well is to use a nest box that has been cleverly placed on the outskirts of your property. This will stop the animal using your home as a hotel, (when used and placed properly) and because the animals are nomadic in nature, you will soon find that the problem isn’t so much of a large one anymore.